Monday's Winds Have Me Worried! Today's 18Z/11 AM MST NAM-4KM 700 MB (10,000' MSL) Wind Forecast. 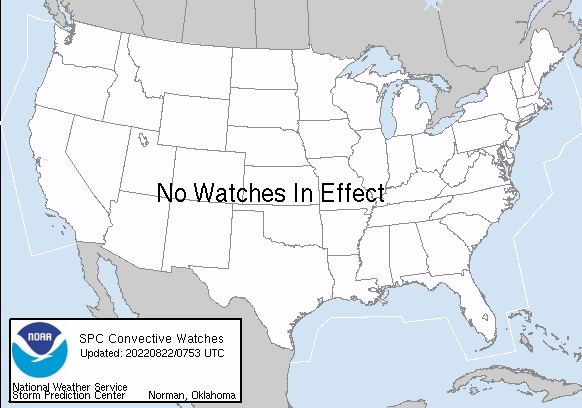 Valid @ 2 PM MST Monday, February 1, 2016. Blog Updated @ 7:12 AM MST Monday, February 1, 2016. High Wind Warning Chaves & Lincoln Co's. SW-W Winds Today Sustained At 35-50 MPH Gusting To 55-65 MPH. 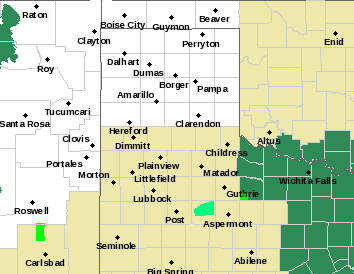 High Wind Warning Eddy/Lea/Culberson Co's & Parts W TX. 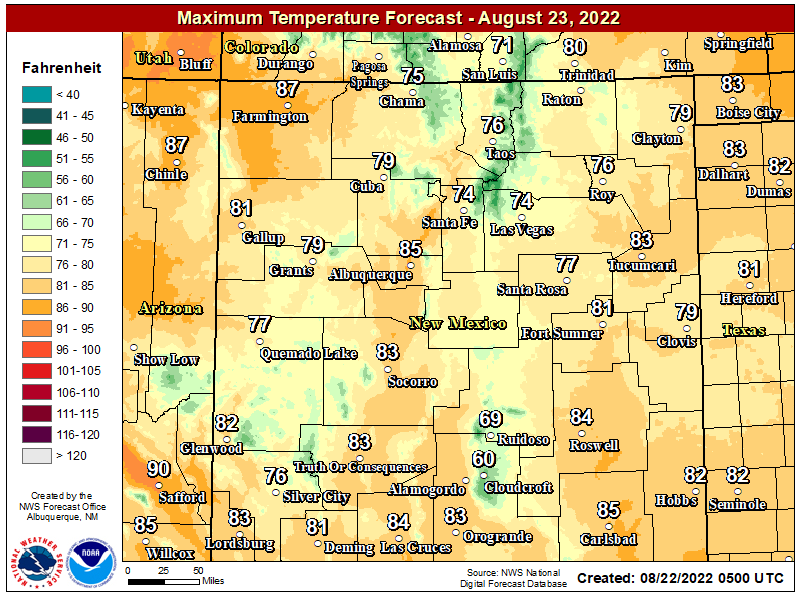 SE NM Plains- SW-W Winds Today Sustained At 30-50 MPH Gusting To 70 MPH! 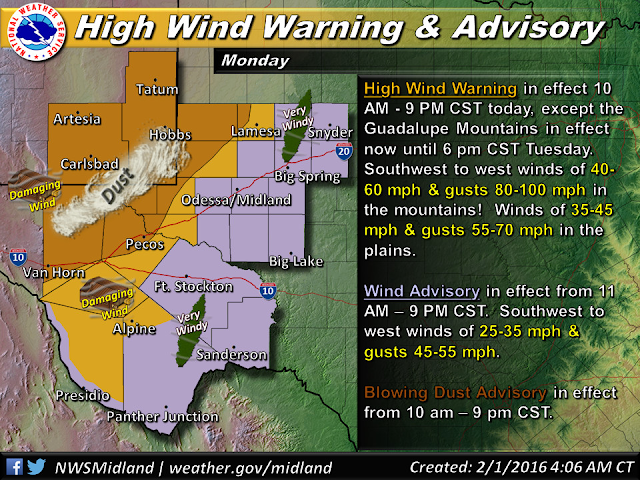 Guadalupe Mtns- SW-W Winds Today Sustained At 50-70 MPH Gusting To 100 MPH! 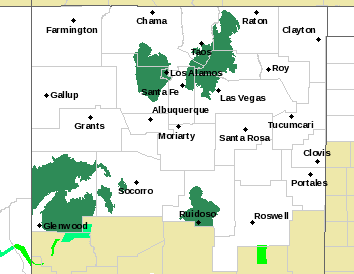 High Wind Warning Southern NM/Southern Sacramento Mtns/W TX. 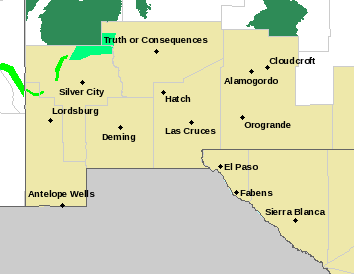 Southern NM Lowlands- SW-W Winds Sustained At 35-45 MPH Gusting To 60 MPH! Southern Sacramento Mtns- SW-W Winds Sustained At 35-45 MPH Gusting To 70 MPH! 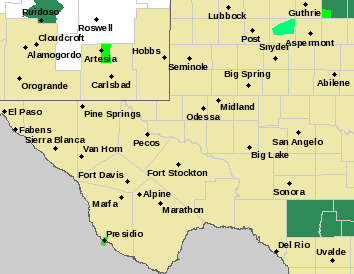 Eddy/Lea/Culberson Counties & Parts Of West Texas. Southern Sacramento Mtns- New Snowfall 2"-5". Near Blizzard Conditions! Peak Wind Gusts Already This Morning Across Southern NM. San Augustin Pass East Of Las Cruces @ 6 AM MST- 95 MPH! Sunspot South Of Cloudcroft- 56 MPH! 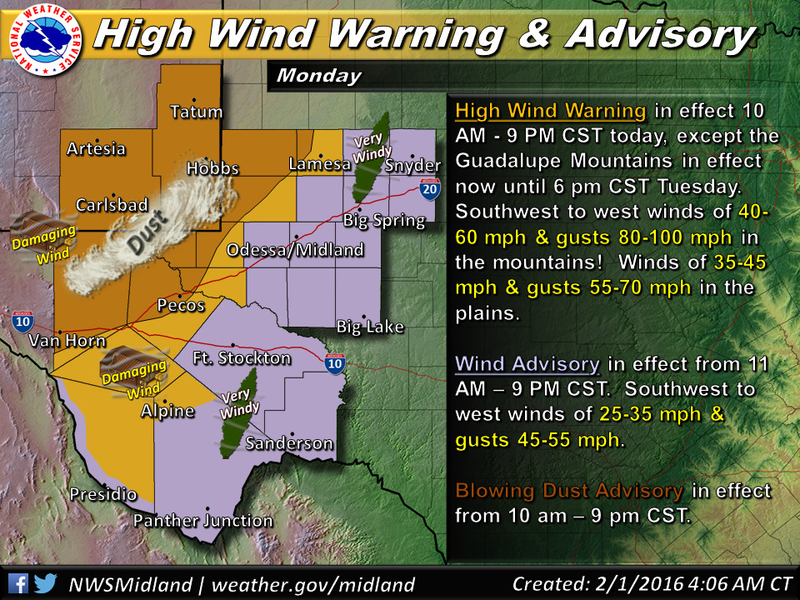 I am concerned about today's winds across southeastern New Mexico and nearby areas. The latest NAM-4KM model run at noon yesterday (Sunday) is still forecasting winds at the 700 millibar or the 10,000' level to range from around 50 knots/58 mph near Roswell at 2 PM, to 70-85 knots/81-98 mph across most of Eddy County, and parts of Lea County and southwest to the Guadalupe Pass area. 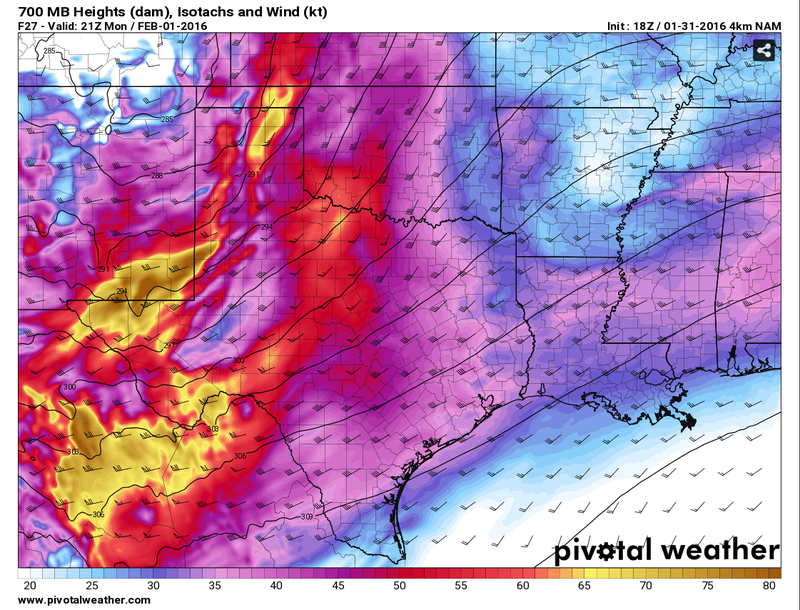 This mid-level wind speed max will be ripping overhead at about the same time as the Pacific cold front works its way onto the eastern and southeastern plains...headed eastward to West Texas. 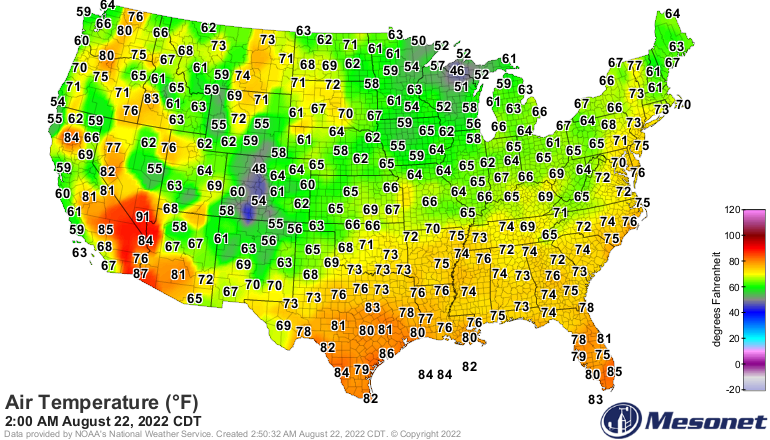 Our daytime high temps will also be occurring around this time before the colder air behind the front arrives. 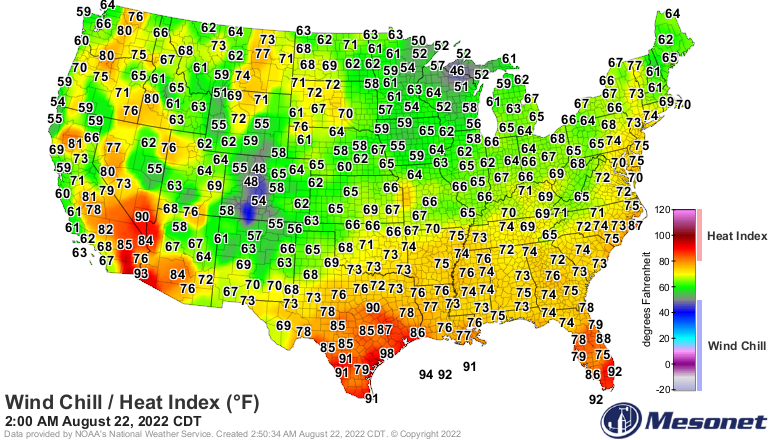 Once the front arrives our temperatures will drop fairly rapidly. As the stronger winds aloft mix down to the surface at about the same time as the front moves through, and during the warmest part of the day...we are going to get blasted by southwesterly winds changing around to the west. Current forecasts still have our winds gusting up to the 60-70 mph range today from the Sacramento Mountains eastward to the state line. 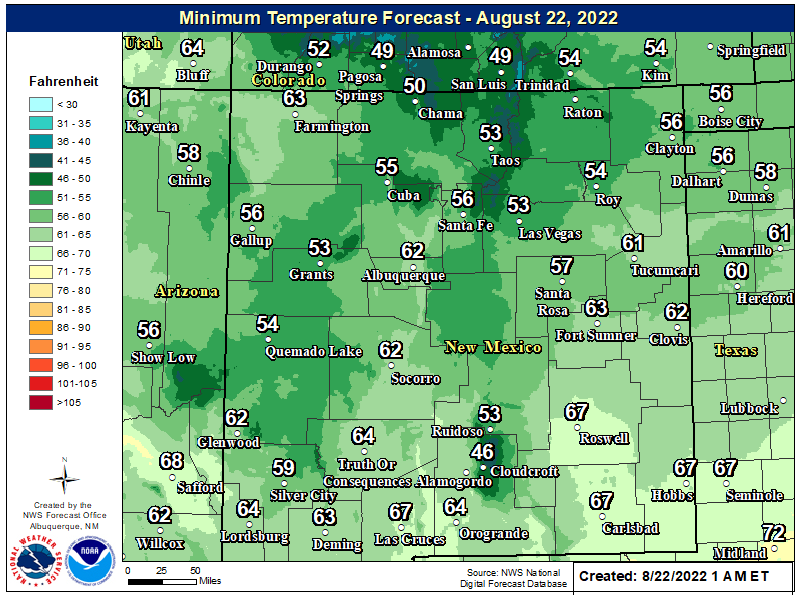 This includes the Roswell-Artesia-Carlsbad-Tatum-Lovington-Hobbs-and Jal areas. High Wind Warnings are still valid for today into tonight. 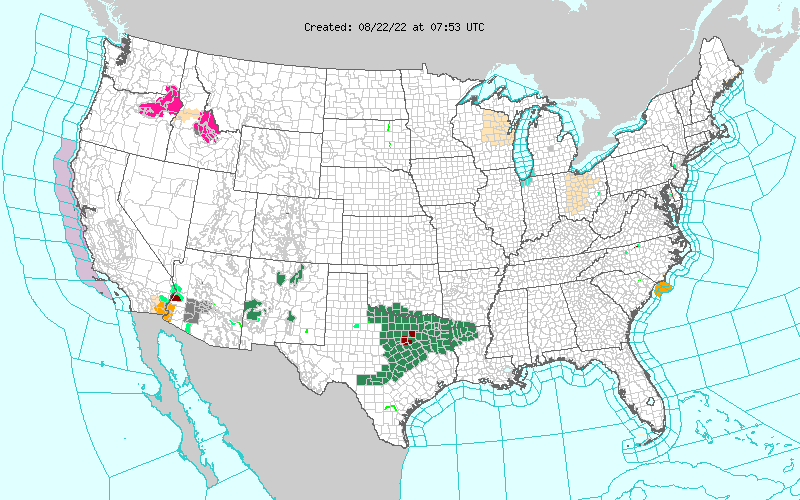 With winds this strong over the region including all of southern New Mexico and south into northern Mexico a widespread dust storm seems likely to me. Do not be surprised if sudden drops in the visibility down to zero occur in a dust storm especially over and near: freshly plowed or exposed farmlands, fields, open lots, and construction sites. Travel in some areas may be hindered by these blinding dust storms and some roads may be closed for awhile. Southeastern New Mexico has a history of multiple car wrecks with multiple vehicle pileups during these violent dust storms. Some of which have had multiple injuries over the past 15 years. In my opinion that potential will exists today. Wind damage will be a possibility today should these winds be as strong or stronger than forecast. This includes damage to roofs, shingles, sheds, barns, and other outbuildings. Some west facing windows may be blown out as well. Power lines may be blown down as well as power poles and other utility lines and poles. Power outages may be a problem in some areas today. Tree limbs may also be blown down with some trees possibly blown down. Irrigation sprinkler systems may be blown away...even tied down and with water in them in some cases. I've seen that happen many times over the years. Given how strong the winds aloft are, the timing of the arrival of the cold front, and the models tendency to under forecast our wind speeds, I would not be one bit surprised if some local wind gusts exceed 70 mph across the southeastern plains on today. 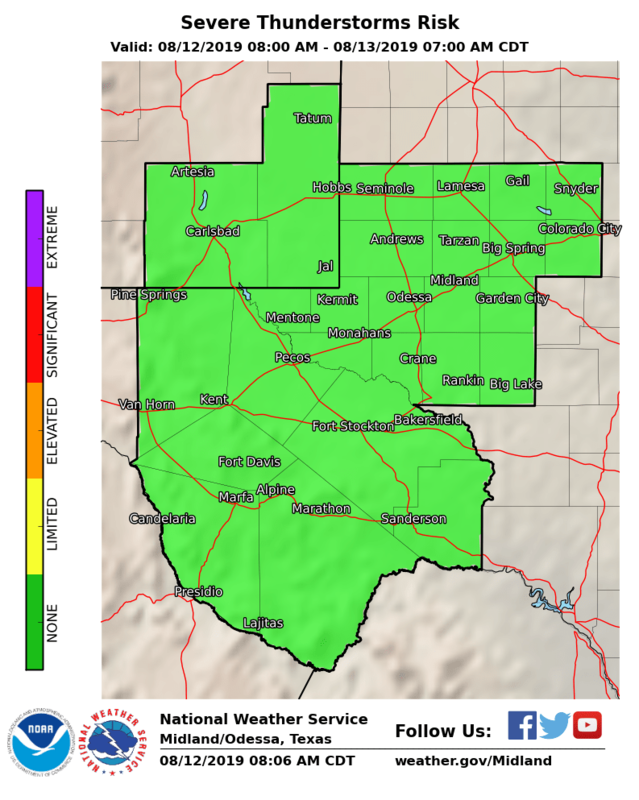 Current forecasts call for southwesterly to westerly winds gusts of around 80 mph across the Guadalupe's this afternoon (Sunday) which should drop off to around 65 mph tonight. But then crank back up to the 100 mph range today into tonight. I wouldn't be surprised to see some gusts stronger than 100 mph. 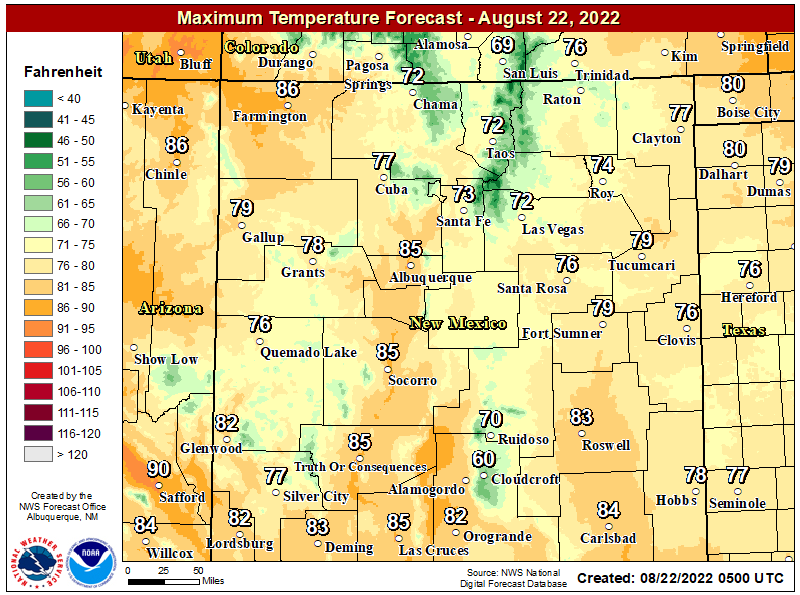 And if the wind was bad enough an extremely high fire weather danger will coincide with today's high winds and blowing dust. Simply put folks avoid all outdoor activity that involves the use of sparks or flame. Any accidental fire that may start will rapidly spread and grow in the high winds and could lead to disaster in a hurry! This could easily cause a life threatening situation with very little to almost no advanced warning.